Sisters Folk Festival, with a grant from the Oregon Community Foundation’s Studio to School initiative, will welcome Hirsch to provide a three-day, K-12 community-wide arts residency in the Sisters schools, April 11-13. 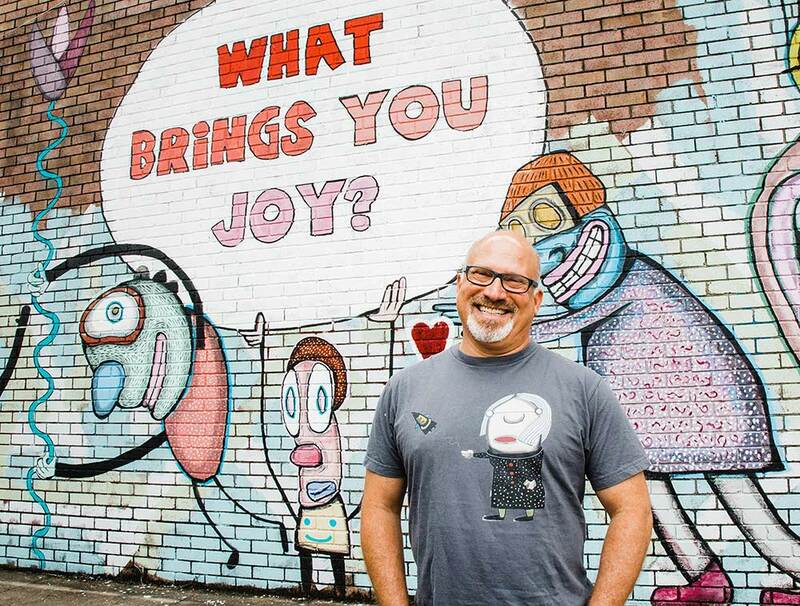 On Saturday, April 13 from 4 to 5:30 p.m., Hirsch invites the community to join a presentation: “Joy Bots: A Conversation and Community Paint Out with artist Gary Hirsch” as a culmination of his visit. The presentation will consist of a TEDx talk, with a painting session immediately following in the Sisters Middle School commons. Admission is free and all community is welcome. You can see Hirsch’s TEDx talk at www.botjoy.com. Hirsch is a dynamic artist, illustrator and speaker; he founded “On Your Feet,” a consultancy in Portland that uses principles of improvisation to help companies around the world relate, create and collaborate. Hirsch’s most recent work is Joy Bots — tiny (and sometimes big) robot armies that bring people joy, hope, courage and inspiration. Sisters elementary and middle school art classes are already incorporating his ideas into their own projects, and kids are familiar with the “bots.” With enthusiasm and support from SSD art teachers Judy Fuentes, Karen Williams and Bethany Gunnarson, Sisters Folk Festival has the opportunity to bring Hirsch to all three schools for classroom workshops and assemblies. Hirsch will present an all-student assembly at SHS and will complete a large outdoor mural at SMS as well. The residency is part of Sisters Folk Festival’s My Own Two Hands celebration. Sisters Folk Festival (SFF) delivers a message of community unification and true belonging with the My Own Two Hands theme this year, “We All Belong.” Hirsch’s presentation, mural and Joy Bot theme ties into the Sisters School District’s support for social/emotional health and wellbeing among students and the community at large. With his “Belonging Bots,” Hirsch will create a discussion around themes: where do we belong, how do we belong, and how do we help others belong. My Own Two Hands (MOTH) started in 2002 as “Painted Strings,” and SFF changed the name to “My Own Two Hands” in 2003 as a way to ask people “How can you contribute to your community, with your two hands?” The “We All Belong” theme this year furthers that idea by valuing the voice of youth, encouraging service to the entire Sisters community, and honoring and uplifting self-expression and creativity; this is something SFF has been deeply invested in for almost two decades. The impact of the arts on Sisters, and Sisters as an arts economy has helped to shape the culture as a place where people can, in fact, all belong. Sisters Folk Festival programs are available to all students K-8 as a partnership with the Sisters School District through the Studio to School Initiative. “For kids, authenticity is something natural. It’s real and raw and true... and it’s a big part of their world,” said Kelley Moen, SFF education program manager. She says that for some, “belonging” is belief in yourself so deeply that you can share your most authentic self with the world, in both being part of something and standing alone. True belonging doesn’t require you to change who you are; it requires you to be who you are in an authentic way.